John Smith had what he thought was a great idea for a hot new info-product. He spent 3 whole months researching the topic, interviewing experts, and compiling the information into an attractive package he planned to sell online for $37. He spent another two months writing sales copy and learning to advertise on google until one fine day he was ready to begin offering his product for sale. No takers. He hired a competent copywriter to rewrite his sales page and started getting some sales, but not nearly enough. Finally he gave up in frustration, hundreds of hours wasted, thousands of dollars poorer. Jane Doe built her info-product around a similar topic, but approached it from an entirely different angle. And she targeted a completely different set of buyers. Jane then took a simple template she found in one of my copywriting products and cobbled together some sales copy over a single weekend. Later that week she was making money. sells well while another one doesn't? Over the years I've coached 187 different info-publishers in various stages of development -- from those green as a head of cabbage to multi-million dollar producers -- competing in 49 different industries, from self-defense... to hypnotherapy... to culinary... to mortgages... to real estate... and just about everything in between. And may I be blunt? chance in hell of delivering the results their creators desire! I'm talking about info-product ideas that are fundamentally flawed from the very beginning. No amount of copywriting voodoo can save them. Trying to fix them with sales copy would be like trying to build a cathedral on sand. Without a sound product idea... aimed intelligently... positioned optimally... your promotional efforts are destined to cough and sputter at the starting gate. Or worse, climb just high enough to go down in flames. Make no mistake -- the overwhelming factor that determines your success or failure as an info-marketer is knowing the difference between info-product ideas that swim downstream, easily providing the lifestyle and financial security you desire... and the duds that flush your valuable resources down the drain. You see, we all have a lot of "idea pride". That's actually a really good thing. It's absolutely essential to our success. But we also need a way to avoid burrowing down unproductive rabbit holes. And we need proven strategies for turning borderline ideas into blockbuster successes. That's why I created The Info-Production Creation Crucible, to save you the ego crushing false starts, dead ends, and disappointing failures that inevitably result when you try to stuff a square peg into a round hole. And to give you proven tools for developing your ideas to their fullest potential. 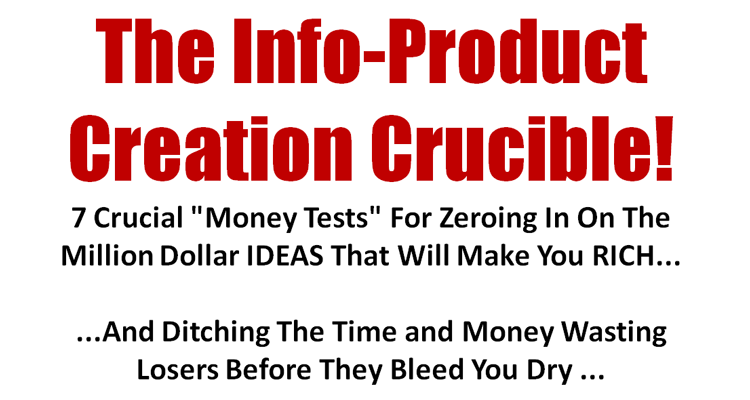 Submit your info-product ideas to THE CRUCIBLE, and I'll give you 7 crucial "money-tests" that allow you to get out of your own head... so you can quickly and accurately gauge the profitability of your next project. concise, straight-to-the-point, 34 page e-guide? It's organized into seven sections, each describing a specific go-or-no-go trial your info-product must pass to have a solid chance at success. And jam packed with specific strategies for pushing a borderline idea into the GO ZONE! A simple distinction that tells you if your product will be hard to sell, or easy to sell. Your product makes perfect sense. People know they need it. But they just won't buy it. Find out why, and what to do about it! Two special situations you should avoid like the plague. An opportunity can appear to be made in heaven, but if either of these conditions exist -- walk away! Look over my shoulder to learn these 7 simple acid tests, and you'll be empowered with a whole new level of clarity. Either you'll end up killing some projects and cutting your losses... or you'll gain valuable new insights for improving them... and the confidence of a lion, for charging fearlessly ahead. Making Ideas to The Info-Product Creation Crucible? I've packed a tremendous amount of uncommon wisdom into these pages, because product selection, targeting, and positioning are by far THE MOST IMPORTANT HURDLES you face on your road to success in the info-marketing business. It's time to set your ego aside and take a cold, calculating, dispassionate look at the viability of your ideas. And to seek out creative solutions for making those that are promising as marketable as they can be. I'm making this extremely affordable, because frankly, I'm getting a little tired of having to personally tear apart people's dreams when they come to me for copywriting advice. The pitfalls I help you avoid in this report are the very same bugbears I encounter repeatedly in my private practice. People pay me a great deal of money ($450 per hour) for copywriting advice, critiques and consulting and far too often I end up giving them this kind of advice instead. It would mean a much swifter, surer path to becoming a recognized and respected authority figure in the niche of your choosing. It would mean the attraction of lucrative new joint ventures and high paying dream clients. And the unbridled success that will seal your destiny as a rich, happy, and self-fulfilled info-marketer! Thousands of dollars and hundreds of hours can be saved with the knowledge I'm offering you. Perhaps millions of dollars earned. And it all begins with The Info-Product Creation Crucible -- available to you risk-free for just $47! FREE STUFF Worth $156 When You Order TODAY! Once you've nailed the perfect info-product to sell... selected the perfect target to sell it to... and zeroed in on the very best positioning ... you're going to need to power up your persuasion chops and fortify your mindset for the battle ahead. You're getting a ring-side seat while I interview one of the masterminds behind arguably the biggest info-product success story in the history of direct marketing. The man behind prospect-targeting and product-positioning for Rodale Press at the time was Michael Fishman. And when The Doctor's Book of Home Remedies rolled out, the first mailing alone took 55 eighteen wheeler transport trucks to get to the post office. That's 24 million pieces of junk mail that brought back 250,000 new customers at a profit. Subsequent mailings sold over 13 million copies and spawned a whole line of related titles. Do you think you can learn a thing or two from this guy? Here are just a few of the rare insights you're about to discover when you get your hands on this incredible interview -- yours free when you order The Info-Product Creation Crucibletoday! Michael spills his most cherished secrets on everything from envisioning an idea... developing it through systematic research... validating it with small scale tests... and ultimately -- rolling it out for massive profits! You're getting this interview in downloadable mp3 audio and full text transcript. Ron was a close personal friend of Dr. Maxwell Maltz (author of Psycho-Cybernetics) and was hand-picked to produce intensive sales training seminars based on the discoveries Dr. Maltz shares in his watershed book. Over the years, over 1.5 million people have graduated from Ron's courses. His application of Psycho-Cybernetic principles to the world of face-to-face selling and my adaptation of those principles to marketing and business in general have meant millions of dollars in additional sales for me. And in this interview I coax the essence of those principles out of Ron as they apply to building a lucrative and personally rewarding info-marketing business. As an esteemed member of my Persuasion Mastery Club, each month you'll receive a raw unedited mp3 recording and transcript of me interrogating one of the world's most knowledgeable communications experts. This brain trust is pulled from a wide range of fields, including conversational hypnosis... social psychology... cultural anthropology... behavioral economics... covert persuasion... and more. During these 1 hour interviews, I extract advanced insights into human nature and applied psychology that can be used to enhance sales and profits in ANY information marketing business. What you'll discover in this month's issue alone (the one you get free with this offer) allowed me to literally triple sales and profits in one of my marketing channels overnight! To help you to implement what you learn, you will also receive my Advanced Secrets of Human Nature and Applied Psychology premium e-Letter. These are my detailed application notes explaining exactly how I am using the insights gained from these experts to make serious money in this exciting business. And how you can too. This is advanced stuff. Admittedly, it's not for everyone. So I'm offering it on a try-before-you-buy basis. Normally, Persuasion Mastery Club membership is $78 per month, but when you submit your info-product ideas to The Info-Product Creation Crucible today you get the first month free. ... And this is especially true of making money with info-products... because successful info-product publishing is about knowing how to spot certain patterns... and knowing how to take advantage of them. Once you know how to recognize and read these patterns, you'll be able to find profit opportunities no matter what the economic climate. When you possess this understanding, opportunity doesn't just knock once or twice -- it knocks over and over again! That's why the rich in this business just seem to get richer and richer... while those ignorant of the simple strategies I'm about to make available to you continue struggling to gain the wealth, recognition and lifestyle you deserve. I realize this isn't the pie-in-the-sky, get-rich-in-your-underwear kind of thing that's so common online these days. The people who fall for that crap simply refuse to let facts cloud their judgment about things. And if you're one of them, then clearly, The Info-Product Creation Crucible isn't for you. You're likely to find the whole process deeply disturbing. On the other hand, if you're sick and tired of the lies and over simplifications that have so far prevented you from realizing your dreams of becoming financially free... doing something you love... providing real value to people along the way. And if you're ready to hold your ideas up to the harsh light of reality, then this could very well represent a crucial turning point for you. You must be totally impressed with the new levels of clarity and confidence you have in your ability to find, develop, and profit from winning info-product ideas -- or don't pay a red cent. You can email us for a friendly and courteous refund for up to one full year if you don't think this is one of the most worthwhile investments you've ever made for growing your info-marketing business. And keep the $156 in free bonuses for your trouble, as my sincere thank you for giving The Info-Product Creation Crucible an honest try. YES Daniel! I'm ready to test my info-product mettle in the searing, molten heat of the CRUCIBLE. Help me get to the blunt truth and capitalize on the hidden opportunities it reveals. For just $47 -- and money back guaranteed for 1 full year -- you're ready to share your hard won secrets of success in this exciting new guide... plus three truly outstanding bonuses worth $156 that I can keep even in the unlikely event I ask for my money back. What could be fairer? Here are the details you need. I’m all over this like a fat kid on cake!